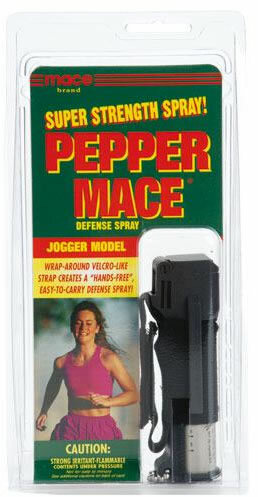 The JOGGER PEPPER SPRAY model is ideal for sports and outdoor activities such as running or hiking. 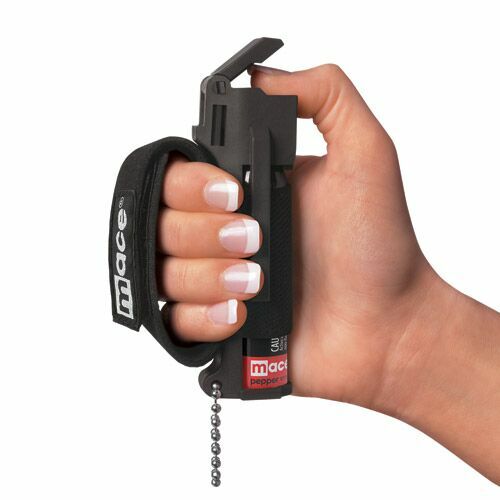 You can carry it on your keychain, fasten it with the belt clip or have it on hand with the Velcro-like strap. 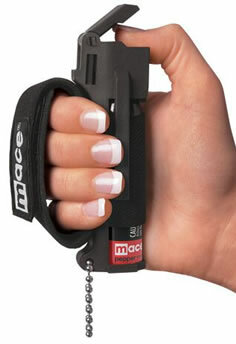 MACE™ JOGGER for those on the run! When you're out running, you're really not thinking about a guy in the bushes waiting for you to pass by. No, you're focused on keeping your pace, what's for dinner tonight, and was Sally really talking about you behind your back? Exercising gives your mind the freedom to wander, put things in perspective, and usually if something was bothering you, to know exactly how to deal with it after your jog. It's a mind cleanser. For many, this is your alone time and you aren't thinking about your safety. With this powerful self-defense spray, you don't even have to keep track of holding onto it because there's a Velcro-like strap that lets you attach and forget. However, if you are accosted during your run, it's right there and ready to put into immediate use. Flip up the cap with your thumb and press down on the button to let out a debilitating stream of hotness! Ever been out for a run and a nasty dog thinks you'd be a good meal? You know you can't outrun him and you know he won't stop till he catches up to you. It's bad enough that you get interrupted but with the pepper spray for running, you can deal with the situation effectively and continue on. You can be sure after the dog gets a blast of this in their face, they will never bother you on your route again. 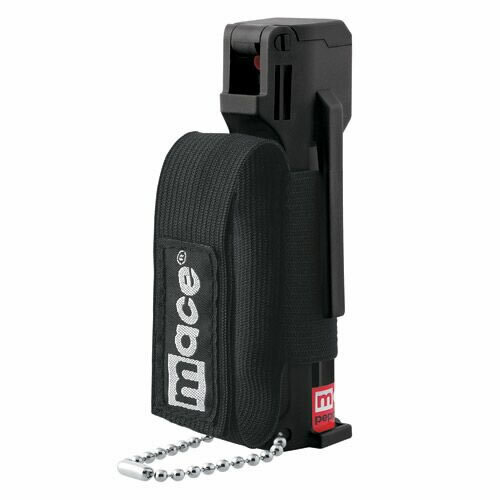 The Pepper Spray For Runners model contains 18 grams of pepper spray (2% oleoresin capsicum), enough for ten to twenty short bursts, with an effective range of 8 to 12 feet. The unit features a flip-top safety cap to prevent accidental discharge. • Effects: Upon direct contact with eyes, respiratory system and mucous membranes, the active ingredients in the pepper spray will cause eyes to slam shut, coughing, and an intense burning sensation to the skin. Effects should lessen in approximately 45 minutes. • Storage: Store your Jogger Spray in a cool dry area away from heat, flame or strong light. Use with adequate ventilation. Do not store it in an environment where the temperature may exceed 120 degrees F (50 degrees C) such as an enclosed vehicle. The Pepper Spray cartridge may leak from over pressurization and fail to function properly. Do not store unit in a cold environment under 32 degrees F (0 degrees C). This may cause depressurization and the loss of effective range. • Expiration: Pepper spray has a shelf life of 4 years from the date of manufacture. Each pepper spray unit is labeled with an expiration date. After this date, the pepper spray cartridge should be disposed of in accordance with the environmental regulations in your area.